Back in 2016 using a bad hosting service nearly killed our business. Learn what happened in today’s episode of Marketing in Minutes – and how you can prevent this from happening to you! How using a bad hosting service nearly killed our business. Why a hosting service is a very important decision for your blog or online business. How to find out whether you can trust your web host. Which hosting we use and trust (and how you can try them out for free). Which web host do you trust? Are you satisfied with your host? Let us know in the comments! In today’s episode, I recommended the hosting service Cloudways. We are affiliates for them – so you decide whether you want to trust us. But since we are affiliates, we can get you a special offer: $15 in free hosting credits. That means you can try them out absolutely for free for over a month! Sign up here. Use our bonus code “THESOCIALMS” (without the “). Set up your new blog by following the instructions. If you need to migrate your existing blog, get in touch with support to use their assisted migration service, or follow the process in the article below. Below is the full transcript of this episode of Marketing in Minutes – if you prefer reading to listening! And often it’s not even their fault. They make a small mistake in the beginning. Something they don’t know will have a big impact later. One mistake that can easily break your business at some point is choosing a bad hosting provider. But wait… How can your hosting service destroy your business? My name is Jonathan Gebauer and this is Marketing in Minutes. Welcome to another episode of Marketing in Minutes by The Social Ms.
I’m Jonathan Gebauer and in every episode, I want to give everything you need to know about one marketing topic in just a couple of minutes. 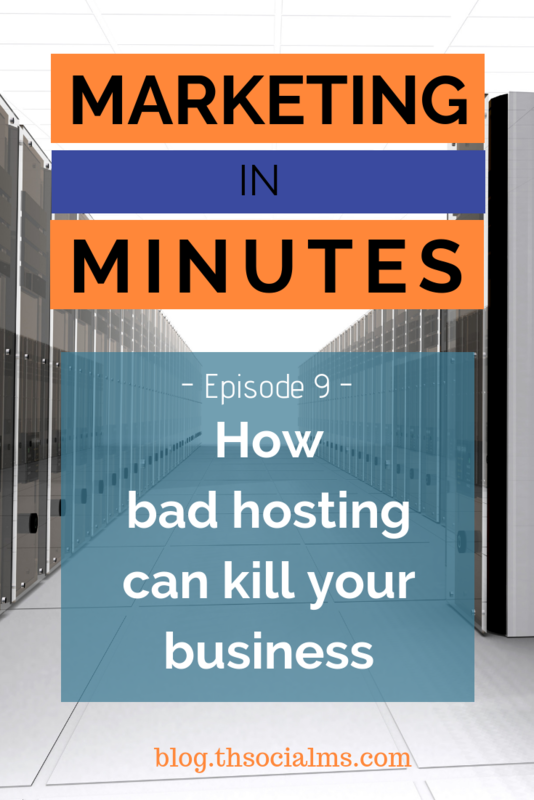 Today: How a bad hosting service nearly killed my business and how you can prevent this from happening to you. In 2016 we prepared a relaunch of our online course – The Online Growth Masterclass. We spent weeks with preparations. We fixed some existing bugs in the system. We also created bonus content for the launch. In short – we had done a ton of work for this. It was a great offer and we were confident! This launch was going to make us serious money. Money we had earned with hard work. The offer went live and we sent it to our subscribers. And then… nothing happened. No one was buying. So we checked whether everything was working correctly. And… it wasn’t. The site was not able to handle the traffic, even though it was running on a so-called unlimited plan. It was either unreachable or terribly slow if you were lucky. That’s when you realize you are losing money and every second counts. The next couple of hours I tried to reach the support team of our hosting provider. I tried their chat support. Their chat support told me that I had to wait 30 minutes. After 30 minutes that number was still 30 minutes. On Twitter, they told me they were having a look at it. Well, stuff doesn’t get fixed just by looking at it. Nothing changed. And while I was waiting we were losing money. A lot of it! I would’ve paid for an upgrade – I just wasn’t given the option. A couple of hours in I decided to pull the plug. It was time to switch hosts – by then I had given up on the launch. I just wanted to fix the problem and never be in this situation again. When you get into entrepreneurship you know there are going to be problems. And I ran into trouble before. But this time I had really believed I had thought of everything. The problem with hosting providers is – you don’t know you have a problem until they burn a hole in your wallet. Trouble always comes when you least expect it. And yes, it happened to me before. Still, I hadn’t seen it coming. I had planned switching hosting services for a while – so I wasn’t completely unprepared. I knew which hosting service I would switch to. And in the end – it turned out to be a lot easier then I thought. In less than an hour, I had migrated our complete course. We still lost money on the launch – but we were able to save most of it. But depending on your situation, one incident like this can easily cost you your business. And that’s scary – because most people starting a blog don’t know a lot about hosting services. Choosing a bad hosting service will not hurt you at once – it will hurt you in a couple of months. When your traffic grows, you are suddenly going to notice slowdowns on your site. Or when you launch your first product, your site suddenly crashes. You probably took the recommendation of a popular blogger. Or you Googled for reviews. These are all bad ideas. Regarding hosting you shouldn’t trust anyone but yourself. Hosting is big business, and the way most hosting companies grow is via affiliate marketing. That means they are paying other online marketers commissions for promoting their service. And what do these people do? They recommend the host on their blog, or they write reviews. Not all of this is done in bad faith. I don’t believe that all recommendations are made in bad faith. Some popular bloggers probably just recommend a service that in some point in the past was a good service. And it’s easy to stick with a recommendation when it makes you 10s of 1000s of Dollars per month. One of the most reviewed and promoted hosting services is Bluehost. They were also the hosting company we used before we switched. Yet big-name online marketers are promoting it! But it’s not just Bluehost. All so-called all-in-one hosting companies are basically using the same marketing strategy. If you don’t believe me, just take a look at what people are tweeting about them. At any moment in time, you will find tweets filled with frustration about any of them. And the stories are always the same. There is something these companies all have in common. They all advertise very cheap monthly rates, like 4.95, 3.95, or even 2.95 per month. But to get these rates, you have to pay 1 to 3 years in advance. And that’s how they get you: They force you to make an investment. Once you’ve made that, they have you for 3 years. No need to fix your problems. They already have your money. In the story, in the beginning, I switched hosts – but I didn’t tell you where I went. I’m going to change that now. But I will start with a warning. This is the host we believe is best for various reasons. We run all our websites through this host. I don’t plan on switching… ever – but if I do for whatever reason, I will tell you. But, I’m also an affiliate for them. So we are making money if you start a contract with them based on our recommendation. I want to be totally transparent here about this before I reveal who they are. As an affiliate I’m also able to get you a special offer – but more on that at the end of the episode. Let’s reveal who they are first. The host I’m talking about is Cloudways! Cloudways is special as they really only provide an admin interface. Your actual web server will be in the cloud at a cloud hosting service of your choice. That doesn’t cost you extra – all charges are fully transparent and listed on their site. You just select the server type you need and that’s all you need to do. The cheapest option, which is sufficient for 90% of all blogs, costs 10 Dollars per months. Cloudways sends you a monthly bill – and they only charge you what you actually used. If you close your server after a day, you are only going to pay a couple cents. That’s how the service works, but why is it great? 3 reasons. First: Because their administration interface is great and makes it really easy to understand and use. Second: Because should you ever need more server power at any time, an upgrade is available at the click of a button within minutes. And third and maybe most important: Their support is hands down the best support I’ve ever seen. If my server has any problem at all, I just write them a chat message and they fix my problem in minutes. For me, this is why Cloudways is the perfect fit for any blogger and 99 percent of online businesses! As an affiliate, I’m able to give you a special offer for when you switch to or start a website on Cloudways. In addition to their free trial, you can sign up with our bonus code “THESOCIALMS” (in capital letters and without spaces) and get 15 dollars in hosting credits. That means you get more than a month in hosting absolutely for free and can try them out safely! I’ll put some information about Cloudways, this deal, and a tutorial on how to start or switch your blog to them into the show notes. Choosing a good hosting service is absolutely vital for your business. And that’s not just because of what happens when things go wrong – it’s also a feeling of security when things are normal. As an entrepreneur, you don’t get this feeling often. With your hosting service, you can. This episode is going to end now, I want to ask you – are you satisfied with your host? Or are you considering switching? What are your recommendations? Let me know. You can leave a comment in the show notes – or send me an email. I hope you enjoyed this episode and found it helpful. If yes, please subscribe – and if not, let me know what I can do better! If you can’t find the show notes in your podcasts app you can go directly to blog.thesocialms.com/MiM-8. My name is Jonathan Gebauer and you’ve been listening to Marketing in Minutes by The Social Ms.
That’s it for today – take care and return for the next episode.